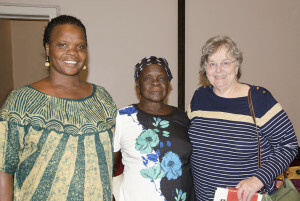 Visiting HSC with our friend Terry Leonhardt on Wednesday were two ladies from Uganda. “I’ve know these folks since July 4, 1997, when my daughter and I arrived there as missionaries (I’m a nurse and my daughter Eva was just out of high school then),” said Terry. On the left in the photo is Abiryo Jane Amayo. She is a school teacher and has worked with disabled children. Sarah lives with her husband and their four children in Gagba Beach, just outside the capital of the country, Kampala. In the center is Otualu Sarah Oleru. She is 86 years old and made this long journey just to come to America. Her late husband was a World War II Veteran who fought alongside the British (they were colonized by the British). When he returned from the war, he became a Minister of the Anglican Church, and died in 1999. They had 17 children (twins died and she had three miscarriages). Two other boys now are dead. Terry said she works at Belk now and cannot attend HSC like she would wish. However, the Biltmore Square Mall is closing at the end of January, so after that, we hope to see her more often at Haywood.